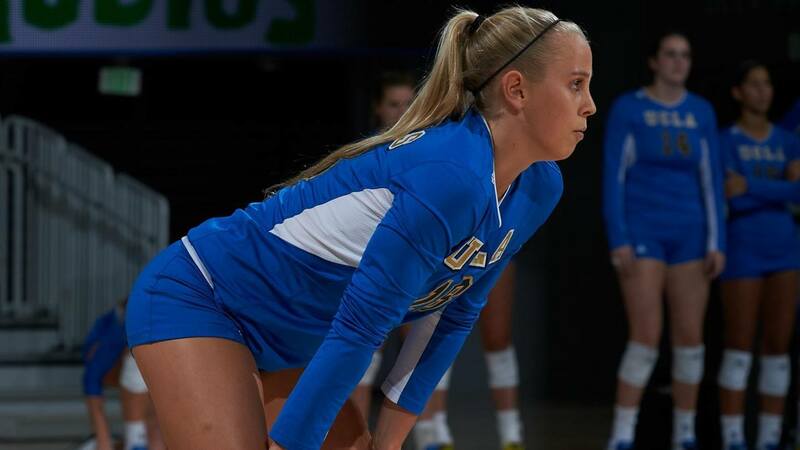 #7 UCLA took their perfect record into San Diego at the USD Invitational Friday evening and continued their winning form as they knocked off UC Irvine in 3 sets. The 7-0 Bruins dominated with 42 total kills led by both Jordan Anderson and Reily Buechler who both recorded 12. Starting setter Ryann Chandler recorded 21 assists and Kylie Miller came off the bench with 16. UC Irvine’s front three proved to be the major downfall. Only recording 3 total blocks and swinging a mere .043 in the match, the game truly came down net play, which UCLA controlled all game. SAN DIEGO, Calif. – Senior Jordan Anderson had 12 kills with a .417 hitting percentage, while junior Reily Buechler recorded 12 kills and seven digs, as the seventh-ranked Bruins improved to 7-0 for the first time since 2006 with a sweep of UC Irvine on Friday at Jenny Craig Pavilion. Set scores were 25-15, 25-10, 25-18. The Bruins hit .368 for the match, with junior Ryann Chandler (21 assists in two sets) and freshman Kylie Miller (16 assists and six digs in two sets) splitting the setting duties. Senior Jennie Frager notched seven kills and just one error in 13 attempts (.462) with four blocks, while freshman Torrey Van Winden, in her first collegiate match, posted six kills, five digs and three blocks. Senior Taylor Formico had 11 digs, while sophomore Zana Muno and freshman Savvy Simo added nine apiece. The Bruins trailed just once in the opening set at 3-2, scoring seven of the next eight to eventually run away with the first. During the 7-1 run, Anderson had two kills, Buechler and senior Claire Felix each posted one and UC Irvine committed three attack errors to put UCLA ahead 9-4. The Anteaters netted the next two, but a 7-2 spurt for the Bruins extended the lead to 16-8. UCLA’s lead didn’t dip below six for the rest of the set. The first and only lead of double figures in the opening stanza came when Buechler recorded her team-best fifth kill to finish off a 25-15 victory. Buechler was error-free in nine swings, Anderson added four kills and Frager posted three. The Bruins out-hit the Anteaters .448 to .139. Simo added four digs. The Bruins never trailed in winning the second set. Even at four, UCLA scored seven of eight to go ahead 11-5. Anderson and Buechler each recorded two kills during the run. At 11-7, UCLA scored nine in a row to bust it open. The run began with back-to-back kills by Anderson and a combo block from Frager and Chandler. Five of the next six points came on UCI attack errors, with the other coming on an Anderson/Frager roof. Leading 23-10, the Bruins scored the final two of the set on a Buechler kill and an ace by freshman Jamie Robbins to give UCLA the 25-10 victory. Anderson led UCLA with four kills in the second, while Buechler added three. The Bruins, who had four blocks in the set, out-hit the Anteaters .310 to -.132. Formico added five digs, while Muno and Simo each had four. UCLA’s only deficits in the third were at 1-0 and 2-1, as a 5-2 run on two Buechler kills, an Anderson kill and two Irvine errors put the Bruins ahead 6-4. The Anteaters evened things at six, but a Frager kill, a Frager/Van Winden combo block and a bad set by UCI gave UCLA the lead for good at 9-6. With the score 14-12, a 6-2 Bruin run thanks to three Anderson kills, a Van Winden kill and a Van Winden/Frager roof got UCLA to 20. On the Bruins’ second match point, an Anteater service error closed out the 25-18 victory. Buechler was error-free again with four kills in 10 attempts, as was Anderson, who had four kills in eight swings. Frager posted three kills and Miller had six digs, as the Bruins out-hit the Anteaters .351 to .119. The Bruins look to extend their winning streak on Saturday at 6 p.m. against #15 San Diego. Live audio, video and stats will be available at UCLABruins.com.